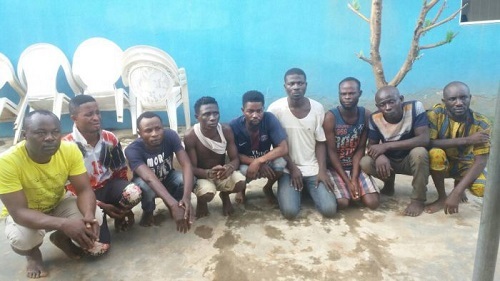 An eight-member gang of armed robbers who killed a bank agent in Lambe junction of Alausa community‎ located in Ifo Local Government Area of Ogun State, have confessed that they murdered the victim because he knew them. The suspects murdered the 38-year-old Sunday Awodiran‎ on May 14, at about 9.45p.m. after he closed from work and headed to his house. They also made away with his N200, 000, recharge cards and ATM card. The Ogun State Police Public Relations Officer, Abimbola Oyeyemi‎, said in a statement Tuesday that the suspects had made confessional statement on how they robbed and why they killed the victim. Mr. Oyeyemi said the case was reported to the police at Ajuwon Divisional headquarters and the Divisional Police Officer, Kazeem Afolabi, was given a matching order by the Commissioner of Police, Ahmed Iliyasu, to bring the killers to justice. “On interrogation, they all made confessional statements to the fact that they decided to kill the victim after robbing him of his money because they were all known to him,” Mr. Oyeyemi said. He said the commissioner had ordered the transfer of the case to the Federal Special Anti-Robbery Squad for investigation and possible prosecution.